We currently accept bank transfers from accounts in Europe, UK, and the USA. We also accept credit cards, as well as payments via PayPal or Bitcoin. We will never store your financial data on our servers, they will be encrypted and protected by the payment platforms we support. You may have to pay VAT when you buy an animation video. If you are a company or a private citizen based in Estonia 20% VAT will be charged. In which format will the animation video be delivered? We can deliver the video in any type of format required. By default, it will be in Full HD (1920 x 1080) format. If you need any other video format, or if you are unsure, please let us know where and how you will use it, so we can advise you on it. You. Once the payment is complete, you will have full rights to the final video to use as you wish! You will also be issued a commercial release. You can of course upload it to YouTube or any other video hosting site of your choice. How does the revision phase work? You may suggest changes after each step of the process. After you approve a step in the video process, we will move on to the next. You can of course request further revisions, but this will increase your project cost depending on the changes required. Which type of video animation is best for my business? No one style is better than the other. It all depends on your brand and how you want to be seen by your audience. For more information on what is the best style for your business, please contact us to discuss how we can help you. To begin, we will send you a form with questions that will help you decide on the video you want to make, and help us better understand your needs. Video production starts once the advance payment is made. What kinds of video animation do you offer? 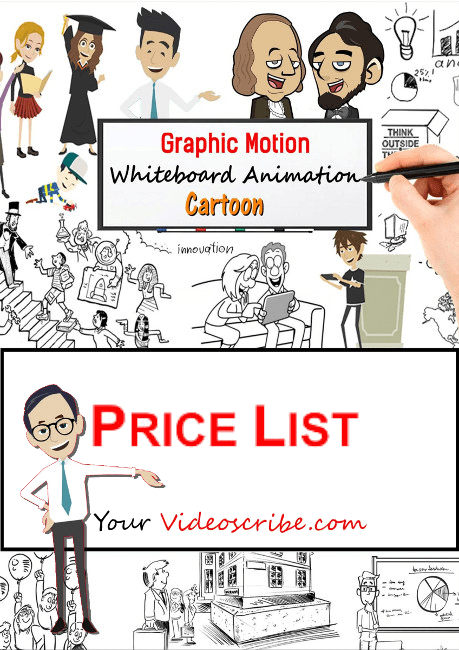 Our styles include whiteboard, 2D cartoon, and motion graphics. With the Whiteboard, you have a hand drawing the contents on a white background or other media reminiscent of a sheet of paper or a blackboard. Images can either be in black or in another color. 2D Cartoons are an all-color video in which characters or things are animated with simple movements like a classic 90s cartoon. Motion graphics consist of three-dimensional objects, texts, and graphics in an animated fashion. How can I use my animation? My animation is amazing. How can I thank you? We consider your written or video testimony as the best compliment. You can also recommend our company to new clients who may need video animations. Over 50% of our business comes from regular customers or word of mouth. We are proud of having satisfied clients all over the world. It must be long enough to tell your story. If it only takes 30 seconds to tell your story, your video should not be half an instant longer. Should you need 3 minutes that’s fine too. All that matters is what you’re saying. Should you need a particular amount of time to tell the story, take that amount of time. The duration of a video is like a fitted dress, go with the exact minimum needed. Would you like to know beforehand how long your video will be? A text of approximately 120-150 words should be equivalent to one minute of video. You can also read the text aloud to get an estimate of the length of the video. Do we have to meet in person to make the video? We do not need to meet in person. Our precise and detailed working method allows us to work remotely with our clients. Between uploads and downloads, e-mails, Skype, and phone calls… you will feel as though we are working next to you. How much does it cost to create an animated video? We offer high quality animated videos at very competitive prices. We offer a complete service, from scripting to design, from voiceover to animation, from music to sound effects. all in HD. While others charge as much as €10,000 for such animated video, we can produce them at a much lower price. Please see our website for an updated price list and accompanying details. We typically need 3 weeks to make a video, to which we must add the time it takes for you to respond. This is because experience has taught us that some customers respond even after several weeks, making the deadline much longer. To the above, we add the time needed for the various revisions required. This is because we have packages that also include endless revisions to your complete satisfaction. The video must be perfect for you. The total realization time is usually 4-5 weeks. Are you in need of an urgent production? We can prioritize your project and get it done within 2 weeks at an extra cost. The price list found on our website shows all the details. I do not have a script ready for video animation. What can I do? We can be of help if you do not yet have a script ready for the video. Our team is made up of professionals who are experts in persuasive writing (copywriters), and scriptwriters who specialize in video animation. Can I use my friend as an off-screen voice? We generally discourage customers from using their own voiceovers, as high-quality recordings require specialized equipment and a trained professional voiceover artist. If you however really want to use your own entry, we will do so. This also gives you a discount on the video animation. Are there any discounts if I provide my own script and/or voice over? Yes, we offer discounts for satisfactorily written scripts and/or high-quality voice over.You will find all the details in the price list on our website. With a subscription, you pay a discounted price for recurring and periodic videos. By purchasing a subscription plan, you start an automatic renewal cycle at the end of each monthly, semi-annual or annual subscription period. You may cancel this renewal at any time: once you do, you will no longer be charged at the end of the current subscription period. You are required when purchasing a subscription to enter a valid credit card or PayPal account. This payment method will be reused at the end of each subscription period, and then your card or account will be charged automatically unless you have canceled the automatic renewal. You will be notified by email if your payment method is no longer valid (e.g. when your credit card or PayPal account has expired), and you will be prompted to enter another payment method. Your subscription will be automatically canceled if your payment method is not promptly replaced by a valid one. Please note that the cancellation of the automatic renewal of a subscription prevents subsequent payments for the subscription cycle. There are no refunds for subscription renewals that are canceled after the renewal date. Does Your Videoscribe offer discounts for non-profit organizations? Yes. We offer an extra discount for non-profit associations. Contact us by phone, chat, or email, and we will be happy to discuss the next steps with you.